Today would have been the day, had I not kind of wussed out. And by "kind of", I meant "totally". 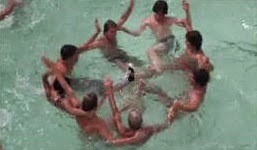 Today is the competition for the synchronized swim teams at the Gay Games. Yes, I was considering doing it on a lark, and I even found four people (including myself) to participate. But it seems when it comes to the joke competition, I'm not much of a leader. I probably would have gladly followed if someone took the reins for me. First off, I sampled the YouTube vids of other teams from other Gay Games - these queers b serious. I had zero intention of being anything but a purposeful joke, and I figured that might piss off some fags. I'm still not sure I agree with the Games' little league mentality of everyone gets a participation medal. (ok, I'm totally sure I don't agree with it.) Hell, I'm 94% certain you got that medal when you checked-in, so in theory you don't even have to participate - you just get to walk around with some faux medal you got for paying $70. Oh, and when manning the First Aid station, I saw a guy with a medal and congratulated him on his win. It turns out he was wearing his medal from the 2006 Chicago Gay Games. Gurl!!!! Michelle Kwan don't go wearing her old medals around the current games. See, I had to put it in context for them to understand: gay slang and female figure skating. I mean, because you totally know that Brian Boitano and Johnny Weir wear all their medals around all the time. The latter I'm sure are serious too. I've just never been a fan of that kind of body. Orc made. And when you add in orange spray tanning, well, it's just creepy. I'm not sure I'd go on record saying the games were / are run well. In my limited exposure, I saw mucho opportunities to fix thing operationally. Let's start with, the Volunteer check-in area that closed hours before the Athlete check-in, effectively making it impossible to get the gear you needed. When I did check-in, they looked up my name and said - I swear to g-d - "Well, I've done that, but I don't know what else to tell you......"
Mind you, he's sitting there in Volunteer t-shirt with a credentialed badge. So, I says to him, I says - "I believe I get everything you got when you checked-in". And it still took a few seconds for the lightbulb to go off. Lord. And the next day I still found out I didn't get everything. But for both days, there were no clear instructions on what I was to do. Even the first, the people didn't know why I was there at all. I sat around and did literally nothing for hours. At least with the second day at the First Aid station, I had people coming in with pain and needing ice or a bandage, but for the most part it was quiet. Still, no one thought to turn on the ice machines in the facility, so we had very limited ice for injuries. When a coordinator ran out to get some........they brought back one bag. One!!!! Dude, that was such a wasted trip, was what I said in my head. "Do you think you'll need more??". Um...yes, we're open for EIGHT MORE HOURS. I can't say how things went on the athlete side. Hopefully little to no hiccups. Walking into the convention center, three African-American women, all pushing strollers asked me about the Games. I wasn't sure where the convo would go, but they were quite curious and even asked if you had to be gay to participate. I told them people didn't even have to be qualified athletes to participate, but they were thinking of at least checking stuff out. I was trying to be a great ambassador to CLE. I asked almost every player who came into the First Aid area how Cleveland was treating them - no one had a bad word to say about the town, even though it had poured on and off for at least a day. One even asked about about if we were on the upswing and I gave a little 4-1-1. While I didn't play in any reindeer games, I felt good contributing somehow and I was surprised how many athletes thanked me for volunteering. I always have the 2018 games to get my choreographed swimming down. hmmmmm, verrrrry interesting (said in an arte johnson voice). hope the ladies were not there trolling for eligible menz. Don't forget the matching bathing caps, with the detachable floral array. It adds to the show! FYI: faux medal cost $200 (registration fee.) plus the cost of each sport....not inexpensive. I don't even agree with little leagues policy of giving one to each member of little league. You've gotta learn sometime that not everyone wins, and you must earn your own way. I figure the earlier the better. Thank you for volunteering and sharing your experience here. I do think the games are a good thing even though I would save the medals for the ones who actually win. While entertaining the idea of entering an event humorously is a fun idea, your restraint was appropriate.